When building or restoring a classic car, it’s absolutely essential to have a plan. All the good intentions in the world won’t make up for a lack of knowledge and impromptu decision making. And that scenario can be compounded by the fact that many of us work on projects which involve scarce resources and long timelines. That’s why every build completed at the RKM Performance Center begins with a meeting with our talented staff. The owner of this prototypic Trans Am had some pretty straightforward ideas. First and foremost, he wanted a classic that would be reliable and relatively low-maintenance. That’s a smart thing to keep in mind because, as we all know, an extreme build often results in a moody car. Secondly, he wanted something that surpassed Pontiac’s original performance threshold. Because, let’s face it, second generation Trans Ams are often great to look at, but government regulations pretty much choked out most of their performance. Finally, the owner wanted all that fun and drivability wrapped in slick aesthetics that retained the marque’s traditional excitement without seeming ostentatious. 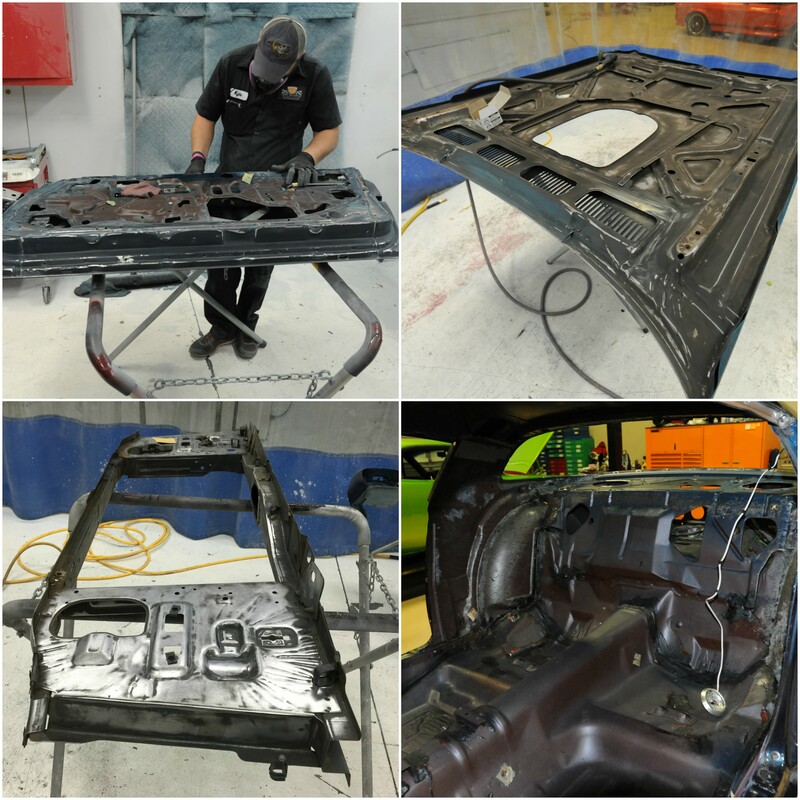 With that plan in place, Performance Center tech Kyle Arias tackled the massive task of complete disassembly. Kyle’s goal was twofold, strip the car as far as possible and keep every component impeccably organized to ensure keen restoration and reassembly. Given this Trans Am is an accident-free, 36K-mile original that was sourced from Montana, it came apart pretty easily. 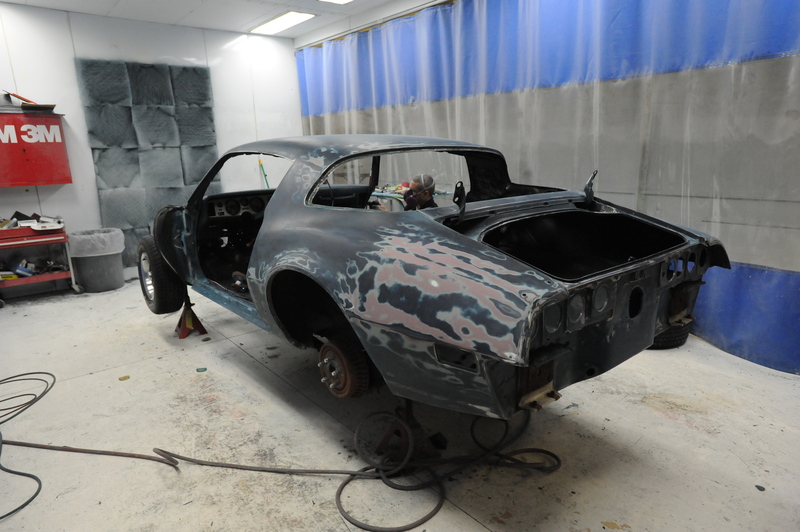 Rust-free body panels, including the hood, fenders and doors, were set aside for sanding. All the vintage glass was carefully removed, in case we decided to reuse anything. 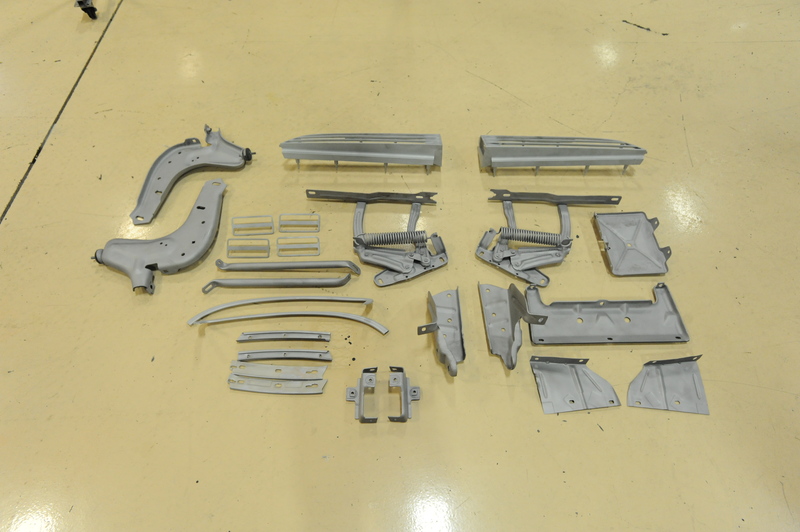 And the car’s front and rear valances, really the only pieces of the fuselage that needed any kind of repair, were sanded, marked and prepped for filler. It’s not that those bumpers were all that bad to begin with. But, as Pontiac guys know all too well, 40 years of vibration and exposure will make even the nicest urethane develop a few imperfections. Inside the cockpit, most of GM’s vinyl was in pretty good condition, but we figured a fresh set-up from Legendary would ensure much more longevity. Unbolting the seats made it easy to pull up the old carpet. Since the doors had already been removed, most of the side panels had already been stripped. The console and shifter had to go to make way for a new transmission. 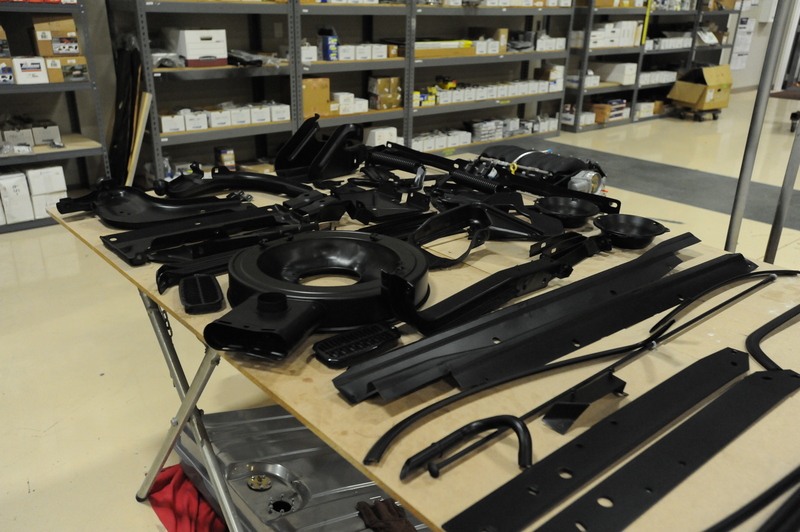 The dash was partially disassembled in preparation for a Detroit Speed AC filler panel. 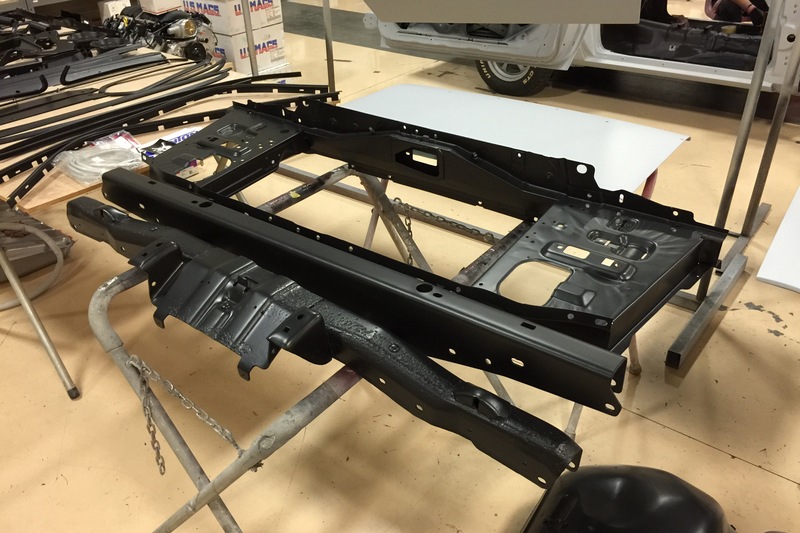 Cleaning up the car’s solid floorpans was time well-spent, as it’ll help us down the road when we install fresh Dynamat insulation. And the factory-sealed trunk was so clean that we decided to leave it alone for the time being. The bottom of this Pontiac is where things got a bit hairy. Like many of its F2 brethren, the car had been coated in Ziebart rust protection. While maximum strength weather resilience certainly isn’t a bad thing, leading Fab Manager Darell Johnston to comment “When it comes to body restoration, this car is one of the easiest Trans Ams I’ve ever worked on”, it’s a pretty big headache to strip away. That led to a lot of sanding and a whole lot of sandblasting. 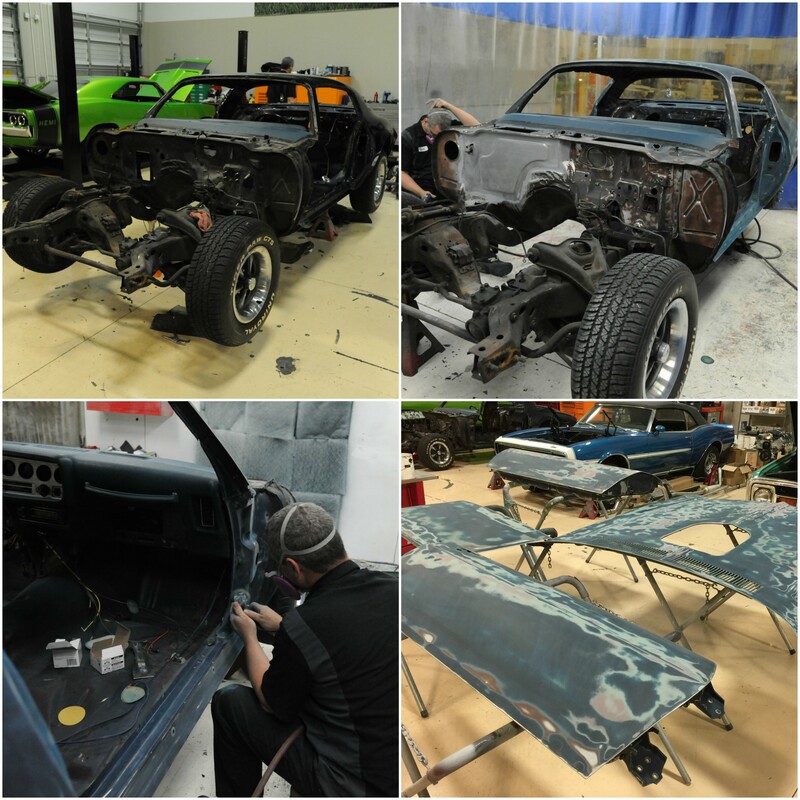 With everything sorted and cleaned, the guys focused on specific parts that needed repair or restoration. Admittedly, the car’s drivetrain and many of its chassis components are going to be updated with better hardware. But that still left us with detail items like hinges, trim plates and supports. In the style of a true nut-and-bolt restoration, all that hardware was stripped to bare metal, layered in two light coats of epoxy and finished in three coats of Trim Black paint. That process appeared to be pretty easy with the exception of the car’s front bumper support. Thus far one of the most labor-intensive pieces of the build, that support was painstakingly stripped of all its original urethane before being treated to the same 5-layer paint process as the aforementioned components. When the techs at RKM Performance Center build a car, rest assured they do not cut corners. Join us in a couple of weeks as we dive in to the next phase of our Trans Am build and begin fabricating the car’s Detroit Speed suspension, modern AC system and high performance fuel injection.